New improvements in diamond wafering blade manufacturing technology have expanded the use of diamond into many other applications and materials. Cross Sectioning is the first and most important step in the sample preparation process. Getting the best results involves obtaining a smooth surface finish, minimum chipping, material deformation, without sacrificing cutting speed. Today, most laboratories, work with dozens of materials. Frequently each material requires a different sectioning method and sample preparation approach. Selecting the right equipment, consumables, and parameters for your specific material/application will significantly affect your sectioning operation. Save you time and money, as well as set the stage for the rest of your specimen preparation process. The ever increasing variety of ultra hard, new generation, composite, engineered, highly metallic content and exotic materials, transform the way we look at cross sectioning. And set many age old conventional sectioning equipment and consumables obsolete. New materials require different technology & sample preparation methods. With sectioning/wafering saw manufacturers recommending a different blade for each material. Abrasive blades for some materials, such as: ductile metals, such as sintered carbides or composites containing predominantly hard phases. Sintered (metal bonded) diamond wafering blades for cutting of brittle materials, such as ceramics or minerals. CBN (cubic boron nitride, and Resin bond diamond wafering blades for cutting highly metallic materials. Many laboratory technicians still spend days and even weeks, experimenting with different consumables, cut off wheels, coolants, RPM’s and many other variables. An expensive and time consuming trial and error process, witch can be avoided with proper understanding of your material, consumables and objectives you need to accomplish. New Generation diamond wafering blades have been engineered to change they way sectioning and specimen preparation process is handled. This article deals with new developments in diamond wafering blade manufacturing, technologies and several misconceptions regarding their use. The following information have come from years of experience inesearch, development and manufacturing of precision diamond products, as well as years of personal experience and observation. New improvements in diamond wafering blade manufacturing technology have expanded the use of diamond, into many other application, traditionally sectioned by other types of cut off blades. Historically Laboratories, R & D, and manufacturing facilities have found the high cost of using diamond wafering blades prohibitive. Relying on abrasive cut off blades to observe brunt of their sectioning work, including application where use of diamond could be advantages. Have been successfully sectioned utilizing new generation metal bond diamond wafering blades with SMART CUTä technology. Simply, a diamond blade wafering blade is a cutting tool which has exposed diamond particles captured in a metal matrix each with a small cutting edge. 1A1R wafering blade is made of a steel core with an Inside Diameter (ID) usually ½” or other size, that rotates around a center shaft. During the sectioning operation, the surface speed may reach 30 m/sec, if using a high speed sectioning saw. This is faster than most cars running on a highway. The cutting action is performed by accumulation of small chips scratched out by the numerous diamond particles impeded in the bond. According to U.S. Standards, mesh designates the approximate number of sieve meshes per inch. High Mesh Sizes mean fine grits, and low numbers indicate coarse grits. Diamond Mesh Size plays a major role in determining the surface finish quality, smoothness, level of chipping you will obtain, and material microstructure damage you will obtain. Finer mesh size diamonds such as 220 and 320 grit are much smaller in size than coarser diamond particles. And will give you a very smooth surface finish, with minimal amount of chipping on edges. These mesh sizes are usually used for fine cutting of a full rage of materials such as: LiNbO3, YVO4, GaAs, and optical materials. Courser diamond particles such as 80 and 100 grit are much larger in diameter and are frequently used fast cutting / material removal on more harder materials such as silicon carbide, zirconia, Al2O3, stainless steels, and other advanced ceramics and high metallic content materials. Witch do not require a very fine surface finish. remove more material than finer diamond particles. This means that coarse diamond wheels are more aggressive for material removal than the finer diamond wheels and will cut faster. However, the tradeoff is increase in material micro damage. If you are cutting fragile, more delicate materials then finer mesh size diamond wafering blades are recommended. Diamond mesh size (grit size) should provide maximum removal rate at minimal acceptable finish. Often the desired finish cannot be achieved in a single step/operation. Lapping or polishing may be necessary to produce desired surface finish, as a secondary step in your sample preparation process. Sectioning can be performed either at low or high speeds. There are advantages and disadvantages of each process. Diamond may break at very high speeds, and fall out at very slow speeds. An optimum surface speed / RPM’s must be selected to balance out the two disadvantages. Diamond Wafering Blade life will usually increase at slower cutting speeds. However the increase in labor costs, utilities costs, depreciation of equipment and other overhead expenses. Will usually offset the saving blade life and other consumables. Cutting speed is often the most important consideration when selecting the right diamond wafering blade for your application. The operator mush choose a balance between life of the blades and their cutting rate. Diamond has a higher impact strength than the material being machined. During the sawing operation, the diamond ruptures the material by impact. Each diamond is able to transfer the electrical power into momentum the breaks the material. By increasing power on your sectioning saw, your diamond wafering blade RPM’s and surface speed will increase as well. Hence, each diamond will chip off a smaller amount of material, reducing its impact force on material being machined. And reducing cutting resistance. In theory, by increasing surface speed / RPM’s, each diamond should receive a smaller impact force. However, because impact is supported by a smaller volume, the impact force with this low volume is actually increased. There is a higher probability that the diamond particles will break or shatter. Hence, sectioning materials at very low surface speeds, creates a large impact force between diamond and material being machined. Although the diamond may not break, the risk that the diamond will be pulled out of diamond wafering blade and causing premature failure of the blade does increase. The proportion, and distribution of diamond abrasive particles, also known as “concentration” has an effect on overall cutting performance and price of precision diamond blades. Usually concentration defined as: Concentration 100 = 4.4 ct per cm layer volume (mesh size + bond). Based on this definition a concentration of 100 means that the diamond proportion is 25% by volume of diamond layer, assuming at diamond density is 3.52 g/cm3 and 1 ct = 0.2g. Nominal diamond concentration in precision diamond blades range from 0.5 ct/cm3 to 6 ct/cm3. This means diamond concentrations are available from 8 to 135). Diamond Concentration is still a factor in determining the life and cutting speed of your Diamond Sectioning/Wafering Blade. Higher diamond concentration is recommended and usually used for cutting softer and more abrasive types of materials. However, the trade off is significantly slower cutting speed. Low diamond concentration is recommended and widely used for cutting ultra hard and brittle materials. D = diameter of blade. One disadvantage of the chip height equation is it does not take the diamond strength and material properties into consideration. This disadvantage may be supplemented by using the Wear Mechanism Indicator or WMI . Wear mechanism indicator is an excellent tool for qualitatively predicting diamond wafering blade wear and life. This method is able to predict to some degree of accuracy when each diamond particle is contributing to the cutting action of the blade. Each zone (region) of this diagram represents the cutting rate of each diamond particle. In the yellow flat region each diamond particle is fully contributing to the cutting rate and remains the sharpest of the three stages. In the blue (micro-fraction) region, diamond particles are beginning to form internal cracks and chip off from the blade bond. Operating in this stage may still provide successful sectioning, however the diamonds will wear at much faster rate. At the orange (extended wear flat region) of Wear Mechanism Indicator diagram, diamond wafering blade will exhibit the slowest cutting rate and performance. Frequently wafering blades at this stage in the life cycle require extensive dressing. Both equations can be used to evaluate the effect of different diamond wafering blade parameters such as: diamond mesh size, diamond concentration, bond type and hardness on the behavior of wafering blade in application. Thus in situations where diamond wafering blade performance is unsatisfactory, it is possible to use these two evaluation techniques to examine the effect of varying parameters to produce a wafering blade that will achieve the expected level of performance. for sectioning ceramics, glasses, silicon, carbides, sapphire, and other related semiconductor and optical materials. And use high concentration wafering blades should on metals such as stainless steel, aluminum, titanium, pc boards. A new technological breakthrough called SMART CUTä technology, in orienting diamonds inside the metal matrix, so that every diamond is better able to participate in cutting action, is making fundamental changes in these beliefs and setting new benchmarks on how diamond wafering blade performance is measured. By orienting diamonds, SMART CUTä technology makes diamond concentration only a minor factor in the overall sectioning equation. Studies and extensive testing shows that diamond concentration in wafering blades manufactured utilizing SMART CUTä technology plays a no major role in determining overall wafering performance. Large number of diamonds in a high concentration diamond wafeirng blade come in contact with material, creating friction, hence considerably slowing down material removal rate. It takes considerable dressing in order to rexpose the next diamond layer. SMART CUTä technology resolves this problem by making sure that every diamond is in the right place and at the right time, working where you need it most. You get maximum use of diamond and bond. Before this technology was developed, orienting diamonds inside the wafering blade bond matrix was impossible. This was one of the main problems faced by diamond tool manufacturers worldwide. Over the decades there have been numerous attempts to solve the diamond and CBN distribution problem. Unfortunately, none of the attempts have been proven effective. Even today 99.8% diamond wafering blade manufacturers still have no way or technology to evenly control and distribute Diamond or CBN particles inside bond matrix, nor properly position them to maximize their machining efficiency. Current Diamond Wafeirng Blade technologies are also inadequate to provide effective control of diamond mesh size (grit size) and concentration of variations on different parts of the same tool. Current technologies also do not allow diamond distribution to be factored in when manufacture a wheel specifically designed for individual material property and structure. The distance between each Diamond or CBN particles determines the work load each diamond will perform. Improper spacing of diamond or CBN particles typically leads to premature failure of abrasive surfaces or structure. If diamond or CBN particles are too close to one another, some of these particles are redundant and provide little or no assistance in cutting and sectioning. Excess diamonds particles increase the cost of manufacturing diamond tools, due to high cost diamond and CBN powder. Yet have no effect in increasing performance. In fact excess and non performing diamond or CBN particles reduce the diamond tools overall performance and efficiency by blocking up the passage of debris from material being machined. In many cases these excessive diamond particles play a major rule in decreasing the useful life of your diamond tool. Conventional diamond wafering blades and diamond tools have been suffering from these type of problems and inefficiencies for over 50 years. The performance of a diamond wafering blade depends on how diamonds are distributed and adhered in matrix. Diamond weak. 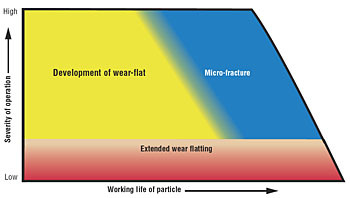 If diamond particles are separated too far (the impact exerted by each diamond particle on material becomes excessive). The sparsely distributed diamond or CBN particles may be crushed or even dislodged from the matrix into which they are disposed. The damaged or missing diamond particles are unable to fully assist in the work load. Hence the workload is transferred on to the remaining diamond particles. 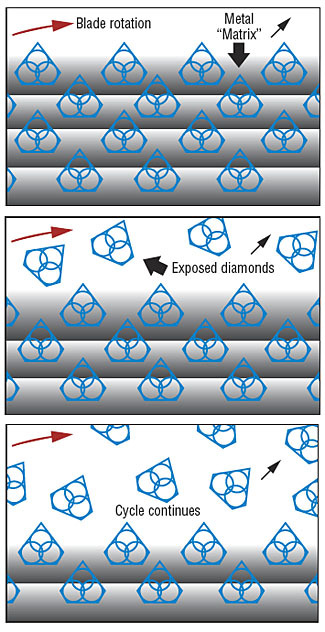 The failure of each diamond particle causes a chain reaction, witch soon results in tool ineffective performance or complete pre-mature failure of the wafering blade. 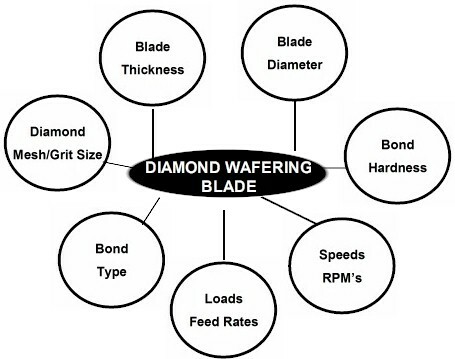 Conventional diamond wafeirng blade usually exhibit the following behavior: After a few dozen cuts, speed of the wafering blade gradually begins to slow down. You will notice excessively longer cutting speeds, and equipment motor bug downs. And since only a few diamonds participate in the machining action, you may find your self applying an increasing amount pressure just to machine the same amount of material. Without properly orienting the diamonds, conventional wafering blades quickly become dull, out of round. With further cutting requiring constant blade dressing, in order to expose new diamonds. By constantly dressing the wafering blade, pressure put forth on material, causes the tool to overheat and loose its tension. The user may find themselves using excessive force and pressure just to cut a small amount of material. Frequently a metal bond diamond wafering blade requires different sizes of diamonds and different diamond concentrations to be distributed at different parts of the wafering blade bond. Most diamond wafering blades wear faster on the edge or in front than the middle. Higher diamond concentrations are preferred in these locations to prevent uneven wear and thus premature blade failure. By making the distribution of Diamond or CBN particles uniform and in a predetermined pattern, tailored to individual customer application. The work load can be evenly distributed to each diamond particle. As a result a diamond wafering blade with SMART CUT technology will machine material faster and its working life will be extended a considerable amount of time. SMART CUT technology promotes not only even diamond distribution. But strong diamond retention as well. Allowing the diamond wafering manufacturer to use of smaller diamond particles. Small diamond particles will improve surface finish, and optimized performance of each diamond particle. (3) As the diamond layer begins to wear out, diamonds in the new layer are immediately activated, replacing the used up diamond layer. The new metal bond ensures that every diamond is in the right location at the right time, working where you need it most. This advanced formulated open bond design insures minimal chipping, fast cut, constant speed of cut, minimal cutting noise, and most important of all minimum loss of precious material. SMART CUTä technology allows the diamond spacing to be controlled in the wafering blade bond matrix. Hence improving every diamond particles performance. Often reducing the need for high diamond concentration, such as 100 con used in wafering blades. Every Diamond in a SMART CUTä diamond bond works like a small horse. Unlike many other bond designs, the SMART CUTä begins to work from the first cut, and remains to work at the same level of consistent performance until you take your last cut. This unique open bond design insures you get the maximum usage of diamond and bond every time you use a SMART CUTä wafering blade. Historically conventional Metal Bonded Diamond Wafering Blades had problems in cross sectioning high metallic content specimens. 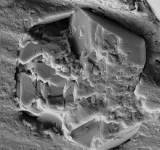 It could take hours cross sectioning materials such as titanium and tungsten carbide with a diamond blade. Most laboratories use abrasive cut-off blades for this application. NEW GENERATION Sintered (metal bond) Diamond Wafering Blades - SMART CUTä technology actually do a good job on metals, not just ceramics. See graph below for comparison of cutting speeds on high metallic content materials. Here is an example of typical sectioning results obtained using the New Generation Sintered (metal bond) diamond wafering blade. prior to cutting. The following cutting parameters were used for each of the cuts made. blades. For all three materials. Diamonds are oriented and evenly distributed through the bond. So that every diamond is better able to participate in cutting action. Diamonds are placed inside bond with no control over diamond distribution or orientation. 100 concentration is used to make sure the blade will cut hard materials. Diamond concentration is dispersed to areas of bond, where its needed most. Every diamond works at the right place and at the right time. The sharpest part of the diamond particle almost always peruses from the bond, growing sharper with each cut. Some areas of diamond bond are filled with excessive number of diamond particles. In other bond layers, diamond particles are rarely sighted. In a few occasions material comes in contact with overly excessive number of diamonds. In other cases, there are almost no diamonds to be found. User must periodically dress blade, to rexpose bond layers. Until new diamonds can be found. Diamond is an excellent alternative to abrasive, carbide, and vitrified bond blades.. Many users have found that ONE blade can last up to 100 abrasive or carbide blades put together. Is a Diamond Blade the right tool for your application? To find out, give our Engineering Department a call at Phone: (661) 257-2288. © Copyright 2002-2009 UKAM Industrial Superhard Tools. No portion of this web page or its design, images, logos, may be reproduced in any form without written permission from UKAM Industrial Superhard Tools.